Botanically, almonds aren’t nuts at all – they’re fruit. Part of the Prunus family, almonds count cherries, nectarines, and peaches as close cousins, but while we savour the flesh of these summer fruit, then biff the stones, with almonds it’s the other way around. Almond trees start producing in their second or third year and remain in production for 50 years or more, so they’re a great long-term garden investment if you’re looking for delicious annual returns. And they’re not just productive – they’re attractive too, with fragrant pink and white blossoms, followed by slender, finely-serrated leaves. After the burst of blossom in early spring, usually at the end of August, the furry fruit – like flattened peaches – is ready to harvest from late February. When ripe the hulls naturally split open to reveal the shell of nut inside. Most almond varieties grow up to 5m tall but the cute, self-fertile dwarf variety ‘Garden Prince’ grows only to a maximum height of 3m – perfect for potagers and pots. Beautiful pink blossoms are followed by medium sized, sweet nuts. ‘Garden Prince’ is a low chill type, making it suitable for northern areas. ‘All-in-One’ is a frost-hardy variety, bearing heavy crops of soft-shelled nuts with sweet-flavoured kernels. It’s also suitable for northern areas as it needs less winter chilling. The tree is a semi-dwarf, growing to 4.5m high, and is self fertile with white, early spring blossom. If you opt for one of the larger varieties, like the wonderfully named ‘Fatnut,’ be prepared to be ruthless with the pruning saw – the trees are vigorous and need a firm hand. Almond trees like sunny sites with fertile, self-draining soil. Mulching around the base of tree, regular watering and feeding with balanced fertiliser gets young trees off to a good start. 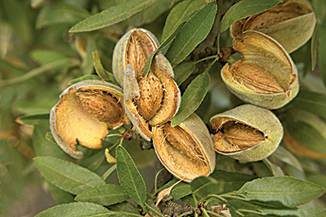 Almonds should also be pruned to an open vase shape in late summer, which helps keep the tree smaller while promoting fruiting growth – the open shape allows for air movement to minimise disease issues. Home-grown almonds are the ultimate health food – the kernels are nutritionally rich with high levels of protein, vitamin E, calcium, folate, magnesium and phosphorus, and because it’s gluten-free, ground almond flour is a versatile baking ingredient for those suffering from celiac disease.